I moved (back) to Nashville a little over a year ago, and I was coming off a few really good hair years, to be honest. My time in France helped me train my hair so I was only having to wash it twice a week, and it was always full of bounce, never oily or overly dry. But then I started spending more time in Nashville, and I don’t know if it was the air or the water or my apartment’s pipes, but everything started going wrong. Oily at the roots, dry at the ends. No vibrancy, zero bounce. Suddenly I was having to wash more frequently and that led to more dryer time and curling iron time and I was in an bad loop. And then I found Prose. Seriously. I’m a beauty and hair care product junkie - always have been. And I have never tried a haircare line that did so much for me in such little time. After 3 weeks, I knew this was really love. Here’s how it works: you fill out a survey and answer questions about your hair goals, your current hair status, where you live, if you are an avid exerciser, if you color your hair, if you dry your hair with a hair dryer or let the wind do it’s thing. It’s all in there. And at the end, you get a custom kit with formulas just for you - with your scent of choice and your name on each bottle to boot! Oh, and yes, it’s all natural. 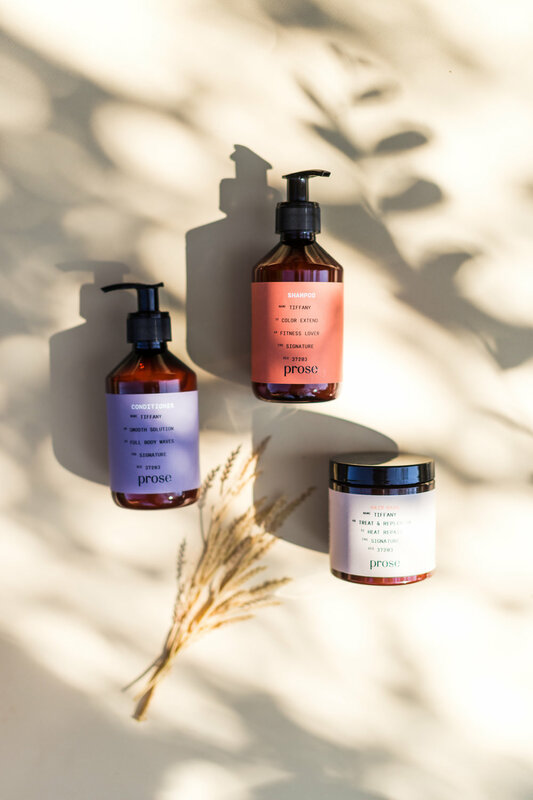 According to their website, they’ve curated a portfolio of 76 highly effective, natural ingredients that are all organic or eco-certified and made from sustainable resources. You go, Prose, you go. You can learn all about some of those 76 ingredients here. The mask is special because you apply it before you shampoo, and it helps to make your shampoo and conditioner more effective. All I know is Prose has brought my hair back to life - heck it might be even better than it was when it was air drying in the French breeze. If I can’t have France every day, at least I can have Prose. Prices start at $25/each. If you can swing it, you won’t regret it. I love sharing the products that make my life brighter and easier. If you enjoy learning about it, give me a little comment below and let me know! And while you’re at it, let me know if you have a favorite hair/beauty product. I’m always up for trying new things!